OIL SPILL HITS PERU’S AMAZON — AGAIN | "Global Possibilities"
Peru’s state oil company, PetroPeru, has been accused of failing to keep its oil infrastructure in good repair, sparking repeated pipeline leaks. Peru’s state-owned oil company, PetroPeru, faces renewed scrutiny following another reported another oil spill in the Amazon, the eighth leak this year alone. The spill hit the community of 6 de Julio in Peru’s northernmost region of Loreto Friday, and was disclosed Saturday by the Environmental Assessment and Control Agency, known by the Spanish acronym OEFA. The leak is under control, according to the organization, but will continue to be monitored. According to a statement from PetroPeru, the leak was the result of an attack on the company’s infrastructure in the region. “Petroperu denounces and rejects a new attack by third party actions against the Northern Peru Pipeline,” the corporation wrote in a statement Saturday of its 40-year-old pipeline, the largest in the country. “The company activated its contingency plan deploying its specialized technical team, who controlled the crude leak and started containment work,” PetroPeru said of its response to the spill. OEFA is monitoring the implementation of the contingency plan, the organization reported. It remains unclear how much crude oil was spilled or how much of the surrounding area was impacted by the leak. The incident is the eighth oil spill to hit Peru’s Amazon since the beginning of 2016. Environmental organizations have reported that leaks earlier this year were spurred by inadequate pipeline maintenance on PetroPeru’s decades-old infrastructure. One spill dumped at last 2,000 barrels of oil, that seeped into local rivers and affected local Indigenous communities, according to the human and environmental rights organization Survival International. Another leak topped more than 4,000 barrels, according to OEFA, accounting for the largest oil-spill in recent years. Earlier this year, the former head of PetroPeru, German Velasquez, was forced to resign after OEFA revealed as false the oil firm’s claims that it had suspended operations of the problem-ridden pipeline, according to local media. 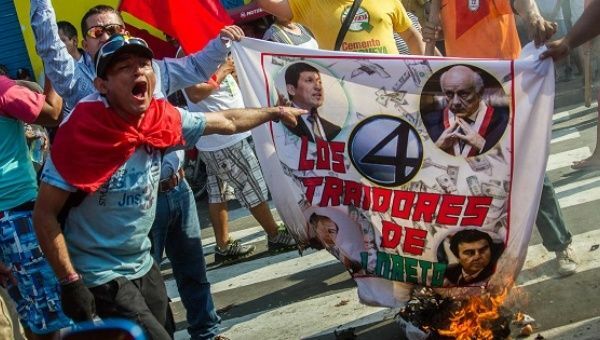 The frequent pipeline leaks are likely to continue to fuel protests against the industry and calls for Peru’s neoliberal President Pedro Pablo Kuczynski to tighten regulations. Oil exploitation in the Amazon has been a hot button issue in Peru for years. The debate ignited a full-blown political crisis flared in 2009, after the signing of a trade agreement between the U.S. and Peru opened up the Amazon to foreign drilling. A militarized police crackdown on the ensuing 56-day protest led to a massacre. Peru has suffered at least two dozen pipeline leaks in the last five years.